Home → MB GPW Parts → MB GPW Frame → Brake Line Kit -Slat Grille, USA manuf. 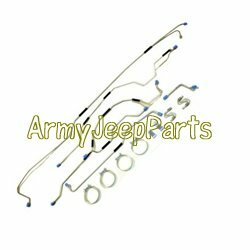 Brake Line Kit -Slat Grille, USA manuf. Complete set steel brake lines, (all preformed steel lines) US manuf. Please note that the axle tube clamps are no longer included since the only US manuf went out of business. Please note most of our competitors are selling Import kits which are not DOT spec!! This kit only works on the early MB's where the rear hose attaches to the axle tube not the top of the diff assembly.